In a large bowl combine all ingredients, except the brandy or Grand Marnier, and mix thoroughly. Cover and leave in a cool place overnight. When you are ready to cook, preheat the oven to 140°C/gas mark 1. 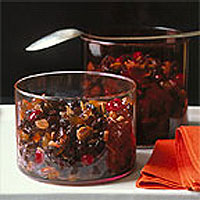 Transfer the mincemeat mixture to an ovenproof dish and stir well. Cover with foil and bake for 2 hours. Cool completely, stirring occasionally, then stir in the brandy or Grand Marnier. Pack in sterilised jars and seal. Store for up to 3 months in a cool place.